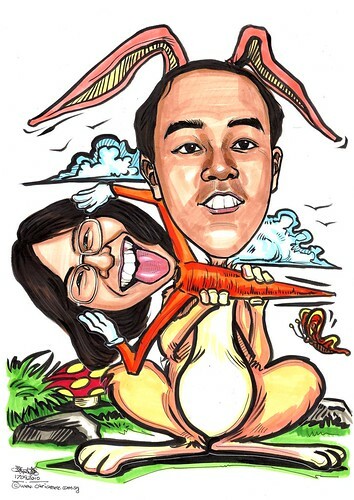 ".....I am interested to do a caricatures for my boyfriend birthday. I will be looking at a A3 size with picture of myself and him in it. As he is born in the year of rabbit, i wanted to have some theme along the line. In addition, our physical apperance differ alot, he is quite big size whereas im skinny. Can i do some thing like he being the rabbit and me the carrot?...." You need such idea from clients to see such caricatures. !